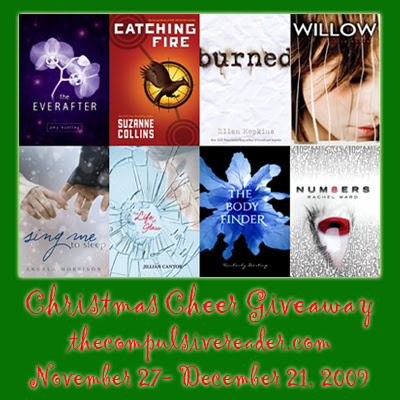 The Compulsive Reader: Christmas Cheer Giveaway! Traditionally, the day after Thanksgiving is the day my family and I decorate the house and bust out the Christmas carols. My family is BIG on Christmas. By the time we finish decorating (it usually takes all weekend, and then some), our house could rival Bronner's Christmas store. We have three Christmas trees in our living room alone! All you have to do to enter is leave a comment below telling me what your favorite thing about the holiday season is. And if you don't celebrate any holiday, tell me what your favorite thing about the winter is. The contest is open to US residents from today until December 21st! Good luck! ETA: I am loving the great response to this contest! I've decided to add another book the giveaway--a copy of LET IT SNOW by John Green, Maureen Johnson, and Lauren Myracle! Keep those entries coming, maybe if we reach 200 entries, I'll throw something else into the prize pack! What a fabulous contest! I could go on and on about all the things I love about Christmas, seriously. But one of my favorite, absolute favorite things, is to go with my family to look at Christmas light displays and listen to Christmas music in the car. We always try to find the oddest Christmas item. We make a list of things to look for, like stars, penguins, Mrs. Claus, but if we can find a really odd one, we get extra points! That's so generous of you! Wow, three trees? That's some serious holiday love! lol. My favorite thing about Christmas is going Christmas caroling. I don't know if I'll go this year, but in the past my church would go out and visit a bunch of elderly members. It would be so much fun, and when I got older we sang less and goofed off more. It was great! This is an amazing contest! I really want to win. My favorite holiday thing to do is to make holiday food like cakes and cookies. I especially love making the gingerbread house. I never want to eat it when I'm done! My absolute favorite thing about the holidays is being with family. It's so much fun to just hang out with family and catch up. And then all the decorations are pretty cool too. My favorite thing about winter is that I get a month off school -my university gives us off from 2 days before Thanksgiving until after the new year. I've got a full month to spend at home with my family and boyfriend, which is nice since I don't see them often during my 10 week quarters. :) Building snowmen and decorating cookies with everyone are some of my favorite parts about being home. My favorite part? Christmas has the amazing ability to be wild and calm at exactly the same time. There's never enough time, what with all that has to be attended or bought, wrapped, mailed, given, but that moment at the end of the day, when the world is lit with colored lights and the familiar carols play softly--yes, that's it. Lovely giveaway with an equally lovely theme! Thank you! The holidays are my chance to see people I don't get to see the rest of the year, and have conversations that are more than one tweet or blog post long! Seeing people is definitely the best part of any holiday! Well let's see my favorite thing about the holidays is the good food and presents! Also, I like when my family comes together because we rarely do that throughout the year. I love so many things about Christmas, but probably my favorite moments are after the presents have been opened and the meal is done and everyone is just enjoying each other's company. This is one of the greatest contests going on right now. My favorite part of the Holiday season truly is giving. Each year, the book group at my school gets together with the money we fundraise and get a family in our area who needs help this time of the year. Each family member provides us with a short list of things they want for Christmas, and we go out shopping for items on those lists. We then wrap the presents and deliver them to the family. It's truly one of the best emotions in the world to watch someone in need smile so brightly because of something you have done. That is what I enjoy the most. I don't celebrate the holidays, so my favorite thing about winter is snow. Not driving in it, but I do love the way it looks. What I love about the holidays? The gift of time. I've never been one for zany expectations, so I definitely enjoy the opportunity to rest with the family. Oh, the holidays! It's my favorite time of year! I love the feeling! Looking at Christmas lights, decorating, sitting by the fire, watching my friends and family open gifts, leaving cookie crumbs and drinking half the glass of milk so my little sister thinks Santa has come. Everything about the holidays is my favorite. People are just happier! :) Great contest, by the way! Mine are days of relaxation with family. I love waking up late in the day (no school!) to the smell of baking with the heat on, making everything warm and delicious smelling. Then just relaxing with my family and watching television. It's just a relaxing atmosphere. Thanks for the amazing contest! I hope you have a great Christmas! Woah you know how to bring out the x-mas cheer. Great contest! In addition, I also like making christmas cookies with my dad. We always make such a mess but have so much fun! OOOO :O So many great books !!!! My Favorite thing about Christmas is spending time with my family. I have a lot of family that I don't see very often and it is always great to spend Christmas together. My favorite thing about the holiday season is the abundance of joy and sparkles. Everywhere I go is decorated and pretty, and most of the time, people are nicer and more friendly. Definitely the food. And the break from school. Now, christmas is very nostalgic to me. It's not the same anymore. Christmas is my favorite holiday. What really put me in the festive mood is the first snowfall. Just seeing the flakes coming down and covering the ground puts me in the holiday spirit. My favorite thing about Christmas is watching the kids open their gifts. They are still young enough to get equally excited by both the small stuff and the bigger gifts. My favorite thing about the holidays? Hmm...that would have to be...NO HOMEWORK!!! I'm off from college and it's a time for me to get to destress a little bit. Not to mention to catch up on all that long overdue reading! I love white elephant, and the special trifle my grandma makes (if you find the nut inside, you get a prize!). My favorite parts of winter are my birthday which is only 4 days before Christmas and indoor soccer! I love my indoor team so much more than any other team I play on so I always have the most fun during the winter. Plus I don't have school on my birthday this year so I'll be partying for the whole week! But I kinda really hate snow so I'm hoping for a green Christmas this year! I feel like the holidays are so warm and compassionate and people actually get a chance to express how they feel, and how much they appreciate eachother. Thats why its so great! And this is an awesome giveaway! GREAT contest.Wow, my favorite thing about Christmas? That's hard...um...I think that it would be giving gifts. I love finding the perfect gifts for people and then having them love it. Or at least pretend to :P But I just love EVERYTHING about it sooo much, it's my favorite time of year. Wow, your family is big on Christmas. Here my favorite thing is the carols, I was born on december 31st, so my mom theorizes that I love carols so much because I heard them none-stop while I was in her belly, she says that when I was a baby the only way to make me stop crying was with the sound of bells. Anyway, besides the carols, I love decorating, I pretty much do the tree in my house, my mom does the nativity set and my dad takes over the street decor... while my sister criticizes our work. I think Christmas Cheer is my favorite thing about Christmas. I love decorating the house or the Christmas tree and having the Christmas Spirit hit me. It's a magical feeling. I also love the music and the movies! I'm really into the oldies Christmas music. You know, the originals. And who doesn't love Home Alone?! Christmas morning with my kids is the absolute best about the holidays. Thanks for the awesome contest! Hm...what do I love most about Christmas? The presents! Not just receiving them, giving them too. I know it's a standard, cheesy answer but it's true. Were we supposed to leave our emails? My favorite thing about the holiday season is sending out Christmas cards and writing a reflective newsletter to remind me of how blessed we are. Making cookies and my birthday (the 20th!). Oh.. and snow! I love making snow angels and having snowball fights (yes, even at the age of 25). Hehe. Wow! What a great contest! By far...my favorite part of the holiday season is watching my 5 year old get so excited! He is counting down the days already! Awesome contest! I love all the books! My favorite thing about the holidays is getting to stay home from work and visit with family. My favorite thing about the holidays is seeing my children's faces light up. They love seeing Christmas lights and decorations. They love helping pick out gifts. And of course, they love opening Christmas presents Christmas morning. This is a most excellent contest. My favorite thing about the holidays is baking. Baking Cookies and decorating them and baking pies and other warm goodies. All this and while they cook sitting snuggled up watching good Christmas movies! I love the day after Thanksgiving. I always get up at two or three in the morning to go shop for all the deals. I usually manage to finish most if not all of my Christmas shopping. Then we eat out breakfast somewhere, and I go home to take a nap. I love the music...some of it more than others...and I love being with the family and giving gifts. I love getting them too, as who doesn't? but I really have some fun ones this year to give and I hope everyone likes them!! My fav thing about the season is having everyone back together again! My favorite thing about the holidays is how everyone takes a little extra time to be nice to each other, to be thankful for all that they have and to remember to be generous with those who don't have enough. My favorite parts of the season are the decorations - I love to go around and see the houses are lite up, the smell of the season - fresh pine, fireplaces outside, the smell of snow when its coming or falling, and of course spending the day with my family. My favorite thing is the way the air smells. Between wood burning fires, spices from kitchens, & snow in the air, my nose goes gaga! Thanks for hosting this great contest! Great contest, by the way, even though the options aren't exactly cheery! My favorite thing about the holidays is the Christmas market in a little town in Germany where I grew up. Even though I've moved since then, I try my best to fly out there during the holiday season to stock up on my favorite things! They have candy that tastes just like mulled wine with none of the alcohol, spicy cookies that introduced me to the wonders of cardamom, candles that come in really cute animal forms, little figurines of people made out of nuts and bolts. Wonderful! My favorite thing about the holidays is that there's finally time to see all my friends, relatives, and people I care about. I enjoy the time I spend picking gifts for people, sending cards, cooking for other people, and also taking time for myself. Great question and a great contest! I LOVE THIS IDEA!!! Christmas to me is remembering the joy, the peace, and the love that we should have with us all year around. Spending time with family in our crazy traditions, watching the faces as surprises as given and discovered. Wow its hard to pick just one!! I love drinking hot chocolate after I come in from a long day of sledding, on a snow day when I'm off from school of course. thanks for holding this awesome contest! My favorite thing about the holidays is sitting down with my family and watching "A Charlie Brown Christmas" and other holiday movies. It's how we pass the time until we can open presents. What a wonderful Christmas gift! This is absolutely my favorite time of year. I love the weather and smells that Christmas time brings. Even though the weather is cold outside the atmosphere transforms into a cozy and warm feeling as the family comes together. My favorite is going to all the holiday craft shows with my mom and getting the family together for some hot buttered rum & listen to my family tell stories of when they were younger! It never fails to be a great time! My favorite thing about Christmas is my family time - my brother and I have school, and both my parents work, so the holidays is a time when we are all home together, either listening to the rain next to the fireplace, or going on our annual Christmas walk, when we all bundle up and walk around the neighborhood to look at decorations at night. Is there a particular significance of having three trees? That must be fun to decorate though! I have a kind of weird favorite thing about Christmas: getting trapped at the mall. I normally hate shopping, and so does my dad so both of us tend to wait until almost the last minute to get our Christmas shopping done. The lines take forever at the check out but that's nothing compared to actually trying to leave the mall. The traffic gets backed up for hours. So my dad always buys holiday cookies and hot chocolate on our way out of the mall, and then we sit in the car singing Christmas songs on the radio. We make bets on how long it will take to get out of the mall parking lot (a minimum of an hour and a half) and then cheer when we finally do. What I love about the holidays is: drinking that first peppermint hot chocolate the day after Thanksgiving; organizing Secret Santa at work; singing along to the carols and shopping for presents for those dear to my heart. Getting together with the relatives and exchanging presents! After we eat dinner we play poker the rest of the night! WOW I read the blogs I follow at work, and I was off yesterday...oh well , I'll try anyway..
My favorite thing about Christmas, other than celebrating the birth of Jesus, are all of the Christmas Decorations..It is never to early to start looking. Awesome hoiliday contest!!! So exciting!!! My favorite part about the holidays is that there is less school, and the desserts!!! My favorite thing about the holidays is watching Love Actually with my girlfriends and drinking hot cider! It's an annual tradition! I live 1,000 from family so getting together with everyone at the holidays is my favorite thing! Oh my gosh I want the signed Ellen Hopkins book SO badly! The other books are fantastic as well! My favorite thing about the holiday season is the Christmas movies/songs! Gotta love it! Thanks! Wow, what a generous contest! How fun! My favorite part about Christmas is everyone is in a good mood and excitement is always in the air. People are more giving, loving, and understanding towards one another. My family and I always donate our time instead of getting so many gifts - that isn't the important part! To see the happiness in their faces just makes everything worth it! This year we're adopting a family who's husband died in the shooting in Ft Hood. They don't have much and are struggling to keep the lights on. We're buying presents for the kids (I'm giving books of course!) and it just makes the Holiday. It's a time of magic and you can just feel it in the air, it's awesome! Wow, what an awesome contest! My favorite thing about the holiday season is how cheery and festive everyone and everything is around this time of the year. Everyone seems to be in a great mood and the decorations that are put up are gorgeous! Love all the love that goes around really. my favorite thing about christmas would be, going over to my cousin's house right after we open gifts. I always have the greatest time there. I would have to say that my favorite part about Christmas and the holidays is decorating my living room and ornamenting the tree. And of course waking up on Christmas morning and remembering that gifts and smiles are only down the hall. Not to mention all the delicious food my family makes together. Clearly I could go on...By the way, this contest is amazing! I love putting the Xmas tree up the day after Thanksgiving. We did it a bit late this year, a little too busy! But we went out and bought a real tree yesterday and just decorated it this morning. Now I'll just wait and see if it snows! I love a fresh covering of snow. 3 trees?! Jeeze, I'd love just just have one, haha. This is a very generous giveaway and thanks for the opportunity! My favorite thing about Christmas is the build up! My family is pretty big on Christmas too and we put out the trains and St. Nick's village along with the fattest tree we can find. What a great holiday (and contest!) it is!! Oh, and I don't think I ever thanked you for taking the time for that interview you gave me way back in the summer!! It was fantastic and I really, really appreciated it! Sorry this is so late...its been pure chaos around here! Thanks and have a wonderful holiday season!! Wow, that's really generous of you! :) And...three Christmas trees in the living room? That's exciting! When I lived in Shanghai, I bought a fake Christmas tree (pretty convenient!) and just left it there for the whole year so I wouldn't have to set it up again next Christmas. I enjoy many things about Christmas, including the food, but what I always look forward to is giving Christmas presents to friends and family, and seeing the look on their faces when they open them. In fact, I like picking out presents for them as well (especially when I see a present that they will LOVE), even though shopping for 10 hours at a time may be tiring. My favorite thing to do this holiday season is spending time with my friends and family as we drink hot chocolate. We all like the coldness haha. We also love to go ice skating. My favorite thing is spending time with my family and decorating the Christmas tree together. Christmas is always my favorite time of year. I love everything about the season. It's the way that the Christmas lights bounce off the white snow in the yard, or the classic music that causes everyone to burst into song. It's the way that everyone seems so much more thankful, gracious and generous, the way people seem to be happier and kinder. It's the look on a child's face when they get that surprise present they've been waiting for, or the way they so simply and eagerly believe. Yet none of these things come close to my favorite thing about Christmas. My favorite thing about Christmas is all of the traditions my family has. On Christmas eve we all gather around and eat a traditional holiday dinner of brats and hamburgers, open presents around the Christmas tree, and then do the annual pickle-in-the-Christmas tree search. I love Christmas, but I think I love my family and the ridiculous traditions we share just as much. This is an awesome contest! Oh my God I love Christmas. I think my favortie think is the carols. Put a christmas cd in and everything is more fun! We listen to music while we make cookies, decorate the tree, eat our Christmas dinner, and open presents! It's seriously the soundtrack of our season. Christmas is my favorite holiday because of the coziness: cold weather outside, fires inside, families hugging, snuggly sweaters, warm drinks, and lots of laughter. Hunkering down on the couch with a fluffy blanket, hot tea, and a good read is blissful. Man, what a sweet contest! I about fell over when I saw Catching Fire on there. My two favorite things about the holiday season are the lights and the eggnog! My favorite thing about Christmas is decorating the tree and making cookies for Santa with my daughters. I also love getting the girls wrapped in warm clothes and jackets and walking down our city's Christmas Tree Lane. I love this time of year. My favorite thing about the holiday season is the breezes outside. Since I live in the south it's pretty hot most of the time, so its nice to have a break from it. Wow, what an amazing contest!! My favourite part of the holidays is making traditions and passing on traditions to my young children. I love seeing Christmas through their eyes now...it is magical! One of my favorite holiday things is listening to Christmas music. I'm such a sap, but there are one or two songs that get me choked up every time I hear them. There are so many wonderful things about the holiday season, such as the lights, the food, that special spirit that infuses people in general throughout, but for me, the thing I like best about the holiday season is spending time with my family. Absolute favorite part is the music. I love Christmas music. I wait all year for the day after Thansgiving when I can finally pull out the music and enjoy. Have some playing right now, actually. Celtic Christmas! I used to really be what would be called a Scrooge around the Holidays, but now that I've gotten older and live far from my family members, I've changed the way I feel about this time of year. My favorite thing about the holidays is being able to spend quality time with the ones that I love. No matter what we do I cherish the time I spend with them. My favorite thing about the holiday season is spending time with my family. I love to experience the the wonder through the eyes of my children. Going home to visit my family. Nothing is better. My favorite thing about the holiday season is how everything seems to be magically transformed. Normally dull houses become shiny and sparkly, streets light up with mulitcolored lights, and everyone seems a little more giving and forgiving. My favorite thing about the holiday season is the lights. I love seeing ropes and ropes of lights against the stark black of the night sky. I also love the smell of a fresh tree...mmmm...that is what gets me into the holiday spirit! And don't even get me started on the food! Comfort food, soups, stews, cookies and delicious pies! Yum! This is an amazing contest, thanks for the opportunity to win! My favorite part of the holidays is seeing all my family. My favorite part of Christmas is the weather! Even though it doesn't snow, it's still really cool and you could tell that everyone's waiting for the clock to strick 12 on December 24th! I love that feeling! Great contest! My favorite part is decorating the tree and giving gifts underneath it Christmas morning. I love seeing peoples faces as they unwrap their gifts! Terrific giveaway!! I don't like the stress but I do love the holidays. We've cut back a lot over the years so it's calmer but I do enjoy the family get togethers and giving gifts. I don't care about receiving them anymore but I do love to make other people happy. Thanks for the offer and happy holidays! What a generous and fun contest! One of my favorite things about the holiday season is making the treats. There are several things we only make this time of year, like Caramel Puffcorn, ginger cookies and of course, the frosted sugar cookies that are Christmas shapes! Thanks. My favorite thing about the holidays is the music. Oh my gosh, once I hear the music, I want family, snow, holiday movies, HOT apple cider, scarves. The Christmas music just gets me in the holiday mood! Amazing contest!! There are so many things to love about the Christmas season. But I think that my favorite has to be the possibility of snow. Living in the South, we really do not get much of the white stuff, but I do love it even when we get a little bit. The best thing about winter in NorCal, what without the snow, and this might sound a little bit dreary, is the way the cold affects the bees. The other morning I went outside to have tea and spy on my neighbors and I saw an apparently dead little bumble bee. I picked him up and took him inside and let him stay on the counter for a while. When I came back, he was rousing! I tickled him with some dried lavender and put a drop of honey on the counter and watched him come back to life. He is really dead now, but it was a fantastic thing to watch. Soaked up more than half of the morning. One of my favorite things about the holiday are the Christmas movies! Cuteee. My favorite thing about the holidays is the visit to the Christmas tree farm. The season doesn't feel like it has started unless I've had a glass of their hot apple cider and watched my husband struggle to saw down a tree :P !! One of my favorite things about the holidays, other than a much needed vacation from the torture that is college, is when they play Christmas carols nonstop on the local radio stations. And when its snowing (or anything other time) I love to curl up on the couch, flip the channel to TCM and watch old B&W movies all day. Plus who loves the feeling of general cheer and goodwill around this time of year? Love it all. Oh and the eggnog. I think I could go on and on, haha! Absolutely love the Christmasy feeling of the holidays, the winter break, and the boxing day sale! And most of all, the new start of a new year! My favorite thing about the Holiday Season is the overall feel. Bundled up in cold air, Christmas music playing at home and in stores, the sight of all the Christmas stuff, etc. My favorite thing about Christmas is decorating the tree. It's just a mess of shenanigans at my house haha. Well, actually it's a tie between that an the Christmas movie marathon on Christmas Eve. Thanks for the fun contest! My favorite thing about the holiday season is the time off from the day job. After tomorrow, I will be off for sixteen days. Nothing can top that! To me the beauty of Christmas is spending time with family. On a regular basis with all our daily activities, family is always apart. During the Christmas Time, Christmas brings us together, and recaptures the love and bonds we have with our families, like no other holiday. Sharing and giving makes it more special! Please enter me for the contest. My absolute favourite thing about the holiday season is my family. No matter what we've been doing, no matter how we're feeling, or any arguments/disagreements we have they are all put aside in favor of spending time with each other and having a good time. This contest is so cool! My favorite thing about Christmas is that my mom does it a little bit different. About 2-3 weeks before Christmas we usually open a gift every-night, then when Christmas day comes we my dad reads us the Christmas Story and we celebrate what Christmas is all about. The birth of our savior Jesus. I love having time off of work and hanging out with my family. My favorite thing about Christmas is the televised burning of the yule log. My favorite thing about the Holiday is driving around and seeing all the Christmas Lights. It's amazing what some people can do with a string of lights. Thanks for the giveaway. These are some great books. What a great way to spread your holiday spirit! The contest sounds like fun and you are able to hear about everyone’s favorite things about the holidays. My favorite thing about Christmas is the anticipation and celebration building up to Christmas. I love decorating, sitting by the fire, reading a good book (Especially YA), and enjoying some delicious hot cider with family and friends! I would say my favorite thing about Christmas, is that I get to see my family members I don't see often. My favorite thing about the holidays is getting together with my family, wherever we decide to celebrate and reconstructing & decorating the "Christmas Rope." Each part of the family has a section of the blue christmas rope, the famed piece of twine that stayed on top of the car the year that the christmas tree flew off of the car on the freeway between Philadelphia and NY City. We don't know what became of the tree-it's a mystery-and I hope that the tree didn't hit your car! But the christmas rope lives on. We sing to it to the tune of "Oh Christmas Tree." I look forward for family coming together and sharing the season with each other. It's a really peaceful and loving time for me. This is a great contest - thanks for the chance! My favorite thing about the holidays is the spirit(the lights and decorations), the food =D, and seeing my family who I haven't seen for a year!